EU Prophecy News: Part 2: The White Horse - A Bloodless Conquerer? This is part 2, you can read part 1 right here. I finally read that report. It repeatedly recommends that the EU become a "security provider" who lives up to its "responsibilities" by keeping the neighborhood secure. How does the paper propose this is done? Through rapid response military force and crisis intervention. But in spite of more than ten years of learning by doing, the EU is currently not able to enhance the security of its citizens or to contribute effectively to countering threats and breaches of peace and stability in its strategic neighbourhood, or indeed in the wider world. Without a strong military arm, the EU cannot live up to its self-imposed duty to project security and development, or meet the expectations of its citizens and international partners like the United Nations to provide added value by operationalising its comprehensive approach to conflict prevention, crisis management and peace-building. 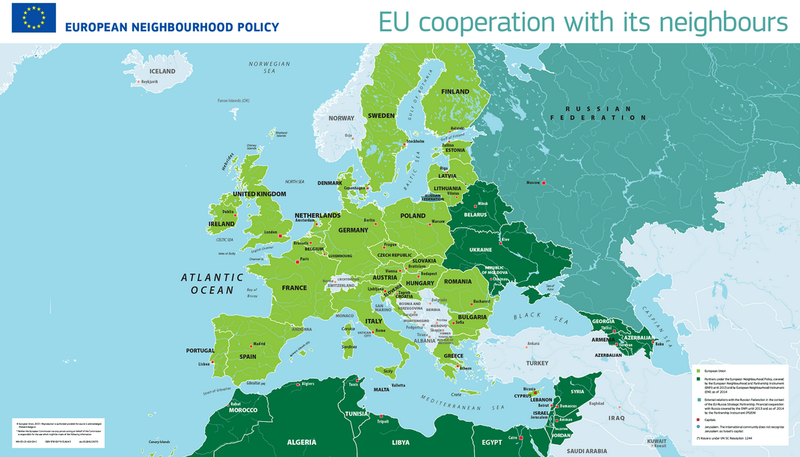 ...in effect infusing foreign policy proper into the technocratic European Neighbourhood Policy (ENP) and upgrading the ENP toolbox with rapid-reaction capabilities drawn from the CSDP. that the EU will be better able to serve its strategic interests and gain credibility as a security provider in a volatile neighbourhood and beyond. The military serves as a catalyst to an integral approach to EU external action when engaging in conflict prevention, crisis management and peacebuilding. Moreover, an ambitious EU foreign policy aimed at reducing instability and state fragility at its borders would take on security responsibilities through the use of military force and rapid response. This is very similar to what Federica Mogherini insinuated during her speech on CFSP to the European Parliament, using very similar wording. The new ENP consultation asks to what extent CSDP should be incorporated into the ENP. Furthermore Johannes Hahn, the ENP commissioner, tweeted that after a meeting of some EU ministers, they had consensus that enhancing the "security" dimension of the ENP was a priority. You can't even make this up. The Roman Empire lives again. The EU, a European force, intends to use the military to "project security" and conduct military operations to stabilize the Mediterranean. Its almost as if a European political entity has every intention of occupying countries around the Mediterranean sea, at least temporarily. Sounds like Rome to me. And to top it all off, all of the countries on this map below have a 7 year relationship to the EU. Flawless execution by God, in his prophetic foreknowledge. Perhaps even those who suggest the seven year covenant will be a "peace treaty" were right too.. The Bible kind of implies Israel has some kind of security agreement breached, though does not specifically say this in Daniel 9:27. Welp, now it looks like we just might get our "security" component for that 7 year treaty as well...if Solana and Mogherini have their way. Of the four horsemen of the apocalypse, the first is the most vague. However, many people who take a "futurist" view of Revelation believe it corresponds to the Antichrist and his conquests in general. Many imply these will be bloodless conquests, done through proclamation or perhaps the threat of military force. After all, the red horse of war doesn't come until after the white horse, not concurrently with it. The brilliant career of this imperial rider on the white horse has been interpreted by the historicists as applying to the golden age of prosperity and good government that elapsed from the death of Domitian to the accession of Commodus. It is far more probable, however, that the reference is to the rise and career of a mighty imperial ruler after the rapture of the Church, who brings under his sway a vast territory in an endeavour to maintain peace, order, and prosperity. - John Walvoord, 1966, "Revelation"
Whatever you think about the rapture part, its irrefutable that this sounds a lot like what the EU is doing now....and what Solana (and his team who authored the book) are repeatedly endorsing. And on top of that, they plan this to be part of their 7 year covenant! It is interesting that the rider makes some kind of dramatic entry onto the scene as a conqueror, just like the other horsemen have a conspicuous entry into world history. After all, world war, painful famine, and a death of 1/4 of the earth's population are really hard to miss. So perhaps the rider on the white horse will be pretty hard to miss, if we know what to look for. If they merge the CSDP into the ENP "toolbox" and actually do (not just bicker and argue about) what they are planning here, it flawlessly meets this picture here, in a very Romanesque way. 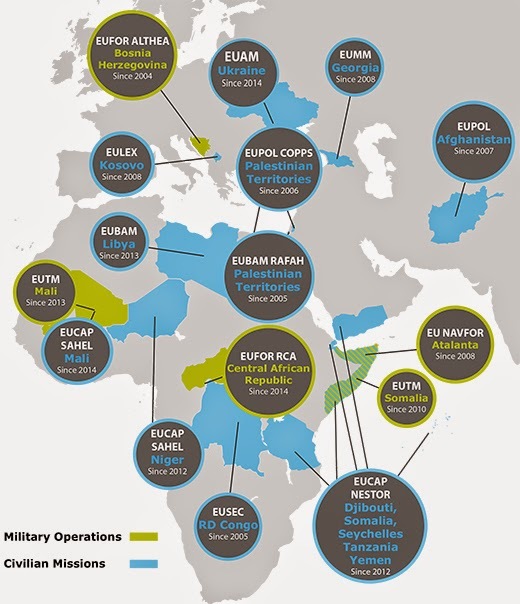 Currently, the EU does lots of CSDP missions, civilian and military. But you will notice these usually don't have a whole lot of teeth to them, hence Solana & Mogherini pushing to take this to the next level. Many events occur in the political career of the Antichrist. But when Jesus opens the first seal, the Antichrist makes some kind of dramatic and conspicuous entry that he hadn't done before. The Bible doesn't necessarily help us with chronology as far as superimposing Daniel 7 on top of Revelation 6. Some authors conclude that the events of Daniel 7 are within the 70th week. But there is no reason to assume that. It is merely useful and educated speculation. Solana seems to be the only guy who can fit Daniel 7 if we don't strain the text....in fact the 10 nation alliance integrated into the EU so no one else can come up among a group of ten. He also humbled and made low and did subdue three of the kings. Yes these three kings still have foreign policy ambitions and still to this day struggle to get on board with CSDP. But he did subdue them. He superseded those three, who tried to represent Europe in many areas, including their negotiations with Iran. They even sometimes leaving the High Representative at home. But after while, they brought him along....then after while... he brought them along. And the rest is history. On 06/06/06 he presented a nuclear deal to Iran, which had the backing of the UN security council. Since then, the ten gave their kingdom to the beast and dissolved the WEU, no longer fully sovereign countries. But I digress.... What we do know, is that there comes a point in the AC's political career, where Jesus finally lets him ride out to do that "bloodless" conquering. * And this dramatic entry will presumably be conspicuous, just like the other three horses are very conspicuous to those watching. Despite other events in his career, the Antichrist makes some kind of grand conquest and perhaps entrance at the 1st seal. And memory serves me well, many authors correlate this event to the launch of the 70th week of Daniel. So since the former High Representative is hanging out in the shadows, perhaps the time will come when he will be that rider on the white horse, making an entrance as a conqueror, coming back onto the scene. Granted, I am speculating to an extent, interpreting this within the Solana framework. However, all this used to seem like a highly unlikely idea to me. *Walvoord states that the fact that the rider has a bow, but no arrows, has been construed by some as implying a "bloodless" conqueror. He states, however, that view cannot be held dogmatically. Isn't that the kind of conquerer the world wants anymore? Appears ripe and ready for the anti-christ any day now. Indeed! It's closer than we all think for sure.